Feathered Flower, by Peter Paone. Courtesy of the artist. PHILADELPHIA, PA.- Showcasing works that have never before been seen by the public, Woodmere Art Museums fall exhibition Wild Flowers: Paintings and Drawings by Peter Paone is an exclusive look at a well-regarded local artists unusual oeuvre. 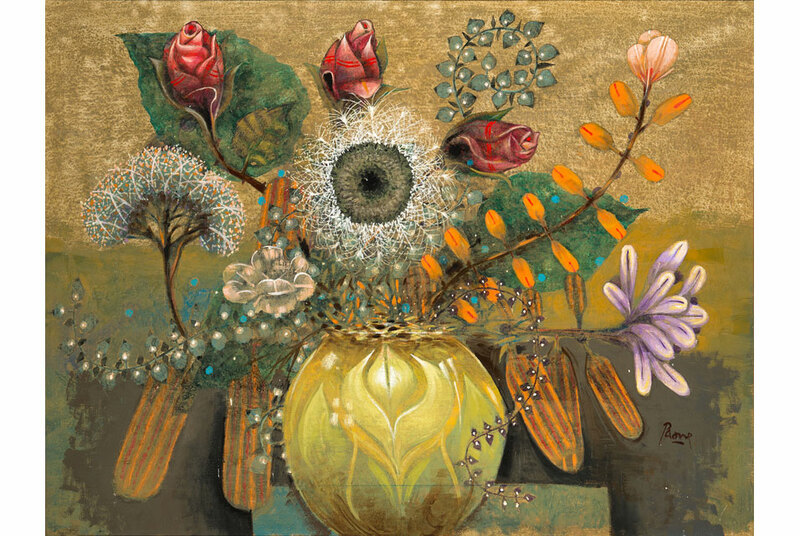 On view September 28, 2013, through January 19, 2014, Wild Flowers is a visual diary of fantastical flower- and nature-based paintings and drawings that chronicle a 30-year exploration within Paones career. Born and raised in South Philadelphia and educated at Philadelphia College of Art (now the University of the Arts), Paone has exhibited nationally and internationally, and yet this collection of paintings and drawings, filled with unexpected symbolism, has until now remained in the confines of the artists Mount Airy studio. Paones invented flowers, together with an array of creatures including animals, birds and insects, interact unsettlingly with a menagerie of characters from Mother Goose and vampire lore, producing a unique artistic vision, rendered with the precision of a great realist painter. Peter Paone was born in Philadelphia and educated at the Philadelphia College of Art. He has taught at Pratt Institute in New York, The National Academy of Design in New York and, since 1978, The Pennsylvania Academy of the Fine Arts in Philadelphia. The artist has received a number of grants and awards such as two Louis Comfort Tiffany Foundation Grants, a Pennsylvania Council for the Arts Grant, A Mid-Atlantic Foundation grant, the first Print Club Award of Merit, The 172nd Annual Painting Prize from The National Academy of Design and three years in London on a Guggenheim Foundation Fellowship. His work has been featured in 52 solo exhibitions in New York, Houston, Fort Worth, Philadelphia, as well as in London, Vienna and Germany. Since 1960, his work has joined that of other artists in 60 national and international group exhibitions. A selected list of public collections in which paintings, drawings and prints are represented include The Museum of Modern Art (New York), The Victoria and Albert Museum and The British Museum (London), The National Gallery of Art and the Library of Congress (Washington), The Philadelphia Museum of Art, The Art Institute of Chicago, The National Academy of Design, Yale University Art Gallery, The Jersey City Museum, The Arkansas Art Center and The National Portrait Gallery. His most recent one-person museum exhibitions include, Poets in conjunction with his photography collection  The Artist Revealed at the National Academy of Design; The Italians at The Jersey City Museum; and Imaginary Watercolors at the James A. Michener Museum.